The Master of Law and Business prepares young professionals for international careers in which an understanding of both legal and business concepts as well as intercultural skills are essential. In today's global economy, lawyers and business people alike are regularly confronted with international issues that involve both legal and business aspects. The one-year curriculum of the Master of Law and Business (LLM/MLB) is designed exclusively for young professionals who strive to be at the forefront of these legal and business developments. Graduates of the Master of Law and Business programme understand complex legal situations, grasp their economic dimensions, and perform effectively in an intercultural environment. They meet the increasing demands of corporations, law firms, and non-profit organisations for interdisciplinarily educated and internationally oriented young professionals. The LLM/MLB curriculum is unique in its structure. Throughout the entire academic year, all modules relate to one overarching theme: the founding and development of a business enterprise, from both the business and the legal perspective. Thus, the curriculum follows the enterprise through various phases, including the founding of the enterprise, transforming the firm into a publicly-held enterprise, going international, merging with or acquiring another firm, and restructuring a firm that is in financial difficulties. By using the development of an enterprise as its structural backbone, the programme creates synergies among its various modules. As a result, students study more efficiently and obtain a better overall understanding of the interrelationship between law and business. The programme links law and business within its individual modules. For example, the module examining the founding of an enterprise considers both entrepreneurship and the question of which legal form to use for the enterprise and how to finance the start-up company. Students analyse these topics not from the perspective of any one national system, but rather from a comparative perspective. This approach allows students to analyse various national approaches to the issues that arise in every business and legal culture. In the second half of the programme, students have a choice of various elective modules, such as Intellectual Property, M&A/Corporate Finance, Distribution and Logistics, Arbitration/Dispute Resolution Management, Corporate Governance/Legal Aspects of Corporate Governance, and Entrepreneurship. Bucerius Law School is the first private, non-profit law school in Germany. Established and funded by one of the country’s largest private foundations, Bucerius Law School honours its namesake, Gerd Bucerius, by focusing on the importance of community service and responsibility for others in society. This visionary institution consistently ranks among the top law schools in Germany educating the best and brightest new legal minds today. Bucerius students excel on German state exams and go on to work with leading national and international law firms and corporations, governmental departments, and universities. 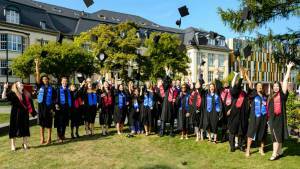 What does Bucerius Law School offer? In the heart of Europe, Bucerius Law School connects the world – it offers the legal education, the practical experience, and the international network to set its students on a successful and fulfilling career path in today’s increasingly globalised world. Bucerius recognises the importance of an international education, cultivates an expansive international network of nearly 100 partner universities worldwide, and has its own representative office in the United States. Bucerius attracts renowned scholars and instructors from the best legal institutions in the world to lecture in its English-language Summer Programmes, the Master of Law and Business, and its International Exchange Programme. The Master of Law and Business (LLM/MLB) was developed by two of the most successful private universities in Germany, the Bucerius Law School and the WHU – Otto Beisheim School of Management. The program is accredited by the German Accreditation Council. In 2006, the first generation of students enrolled in the program, which has since then graduated more than 500 professionals from over 100 countries. 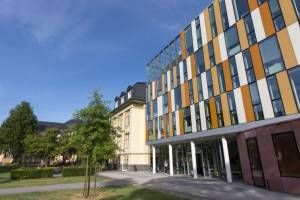 Since 2014 Bucerius Law School offers the Master of Law and Business Program independently. In addition to the unique MLB degree, students now have the option of pursuing the internationally well-established LLM degree with a focus on business law. Furthermore, the program has been restructured to focus on one major theme – the founding and development of an enterprise which pursues both the legal and business aspects of that development. *The Bachelor's degree has to be valued at 240 ECTS (four years) or equivalent. A 210 ECTS credit degree can be considered if the applicant has at least two years of post-graduate work experience. If English is neither the applicant's native language nor the primary language of instruction of the first degree, an official report of results either from the Test of English as a Foreign Language (TOEFL), IELTS, CPE or ILEC has to be provided. Bucerius Law School's institution code for the TOEFL is 7181. Minimum TOEFL requirements are 600 points (paper-based) or 100 points (internet-based). Minimum requirements for the IELTS are 7.0, for the CPE grades A, B, or C and for the ILEC C1 or C1 with merit. German courses are offered at four different levels for students who wish to learn or improve their German. Students are admitted on a rolling admission basis and admission is offered on a space-available basis. Therefore, we encourage you to submit your application as early as possible, especially if you are planning to apply for a scholarship or if you need a visa to study in Germany. For your Application the following documents are required. Please register via the Bucerius online registration form. For more or personal information, come and visit the Bucerius Campus an learn more about the Master Program at our Infodays. The deadline for applicants who must apply for a study visa while in their home country is March 31, 2019. You will usually be informed of the outcome of your application within six to eight weeks. After submitting your application, you may asked to schedule a personal or phone interview. The tuition fees of € 22.000 for the entire program includes all study materials. The Semester contribution is € 250. Students should budget for at least 900 EUR per month in living expenses. Bucerius Law School is committed to affordability, which is why the school offers several merit-based as well as need-based scholarships for students of the Master of Law and Business, e.g., Bucerius Global Scholarships, Partial Tuition Scholarships, Germany Scholarships, and Third-Party Scholarships. The Bucerius Global Scholarship is the most prestigious scholarship offered for the Master of Law and Business Program. It honors the best applicants by providing full tuition as well as a stipend for living expenses. The application deadline for the Bucerius Global Scholarship is January 15, 2019. Described by many as "Germany's most beautiful city", Hamburg combines a high quality of life with a strong economy and countless employment opportunities. Hamburg's success is due in no small part to having successfully united business and legal interests. For centuries, Hamburg has been home to one of the largest ports in the world. In addition, strong media, publishing and aerospace companies - some 350,000 enterprises in all, from large stock companies to a thriving start-up scene - also call Hamburg home. Similarly, Hamburg's legal and political culture has always been defined by its strength and independence. It is therefore not surprising that Hamburg is host to legal institutions of national and global significance, including trial and appeals courts, the Max Planck Institute for Comparative and International Private Law, and the International Tribunal for the Law of the Sea. As a metropolis of some two million people, Hamburg offers a wealth of cultural and shopping activities and a vibrant nightlife. From opera to classical music to the club scene (where the Beatles got their start), Hamburg offers more opportunities than students can possibly take advantage of during their studies. The beautiful Bucerius campus, which successfully combines both traditional and modern architecture, provides a peaceful haven in the middle of Hamburg, adjacent to Hamburg's main commercial district and shopping areas. Just a short walk away, the beautiful Inner and Outer Alster Lakes and their surrounding parks provide a perfect place for students to sail or relax. Public transport is located next to the campus, so students can easily take advantage of all that Hamburg has to offer. Described by many as "Germany’s most beautiful city," Hamburg combines a high quality of life with a strong economy and countless employment opportunities. Hamburg's success is due in no small part to having successfully united business and legal interests. Hamburg has something to offer for everyone. Those who are interested in cultural activities will find Hamburg's many museums, opera and new philharmonic hall (Elbphilharmonie) stimulating. Those who are out to party the night away will find a new home in the Reeperbahn and Schanze districts. The ongoing expansion of the city towards the Elbe waterfront, known as the HafenCity project, will fascinate architecture buffs and casual oberservers alike. Bucerius Law School offers three intensive three-week summer programs in various legal fields. Join talented law students and young professionals from all over the world next summer! The Specialization in Legal Technology and Operations requires participation in the corresponding Bucerius Summer Program in the summer before the start of the MLB program.